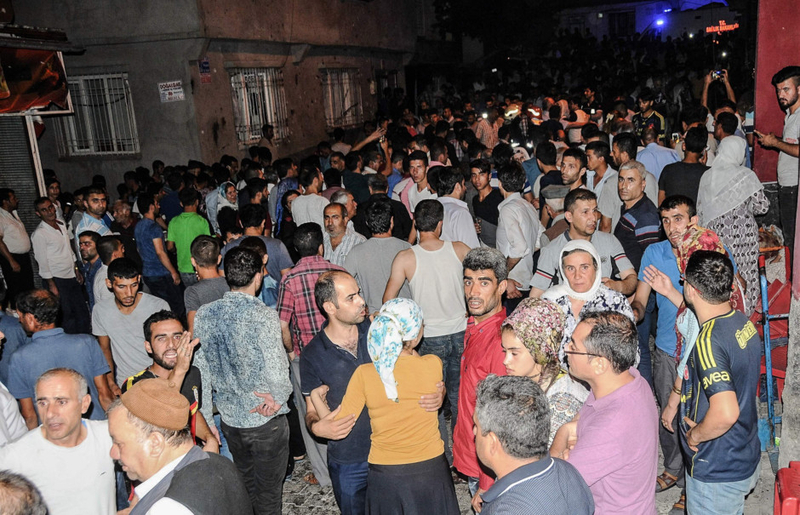 GAZIANTEP,: At least 50 people were killed in a southeastern Turkish city close to Syria when a suspected suicide bomber linked to Daesh militants attacked a wedding thronged with guests, officials said Sunday. Turkish President Recep Tayyip Erdogan said Daesh was the "likely perpetrator" of the bomb attack in Gaziantep late Saturday that targeted a celebration attended by many Kurds. 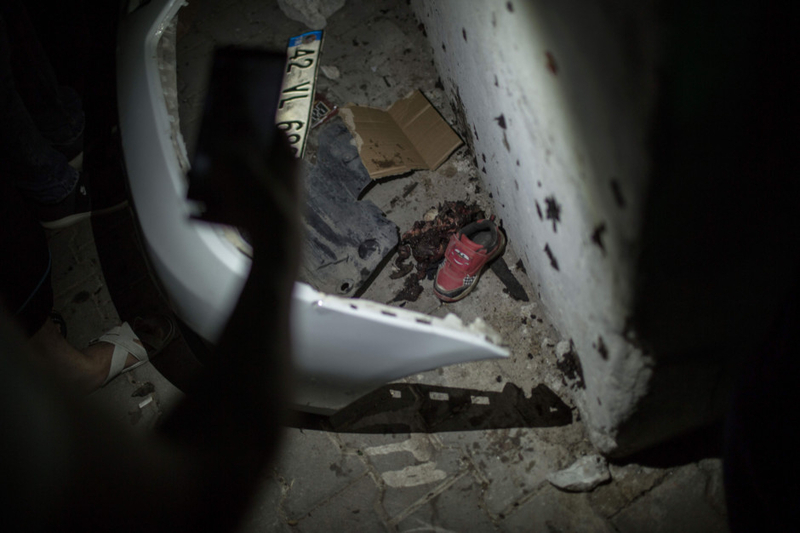 The explosion was the latest attack to rock the key NATO member in a horrific year that has seen strikes blamed on Kurdish and Islamist militants as well as a bloody July 15 botched coup. 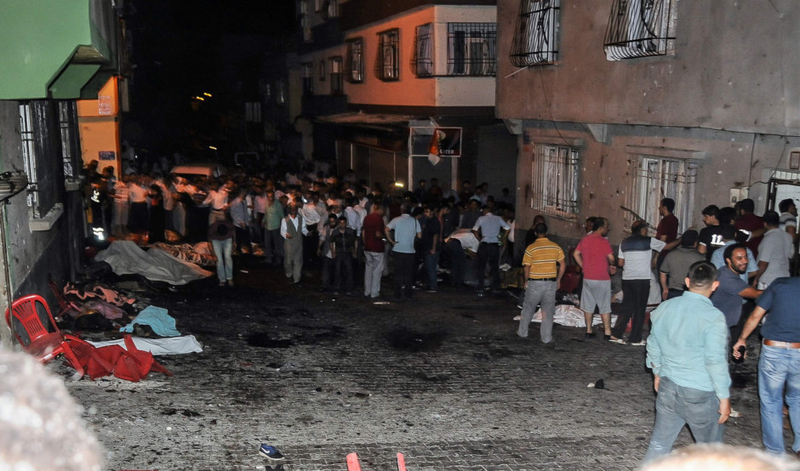 Gaziantep governor Ali Yerlikaya said in a statement that 50 people had been killed, raising a previous toll of 30. He had previously said 94 were wounded in "the abhorrent terror bomb attack on a wedding". Erdogan said in a statement there was "no difference" between the group of US-based preacher Fethullah Gulen whom he blames for the failed coup bid, the outlawed Kurdistan Workers Party (PKK) "and Daesh, the likely perpetrator of the attack in Gaziantep". The UAE condemned the attack, and the Ministry of Foreign Affairs and International Cooperation highlighted the UAE's firm stance denouncing terrorism in all its forms and manifestations, WAM reported. The ministry highlighted the need for the intensified and concerted efforts of the international community to ensure the eradication of the serious scourge of terrorism and to find radical solutions to eradicate this phenomenon, which is contrary to all moral and humanitarian values. The ministry expressed its deepest condolences and sympathy to the people and families of the victims and wished a speedy recovery to all the injured. Reports said the wedding had a strong Kurdish presence. The Dogan news agency said the bride and groom were from the mainly Kurdish region of Siirt further to the east and had themselves been uprooted due to the flare-up in violence with Kurdish militants. The pro-Kurdish Peoples' Democratic Party (HDP) said its members had been present at the wedding which was also attended by many women and children. The Hurriyet daily said the bride and groom - Besna and Nurettin Akdogan - were in hospital but their lives were not in danger. Erdogan said the aim of such attacks was to sow division between different groups in Turkey such as Arabs, Kurds and Turkmen and to "spread incitement along ethnic and religious lines". Many militant jihadists see Kurds as one of their main enemies, with Kurdish militias playing a significant role in the fight against Daesh on the ground in Syria. Prime Minister Binali Yildirim said Gaziantep would show the same spirit it had shown in 1921 when it defeated French forces in Turkey's Independence War which led to the word Gazi (war hero) being added to its original name of Antep. "Our grief is great but be sure our unity and togetherness will defeat all these diabolic attacks," he said. 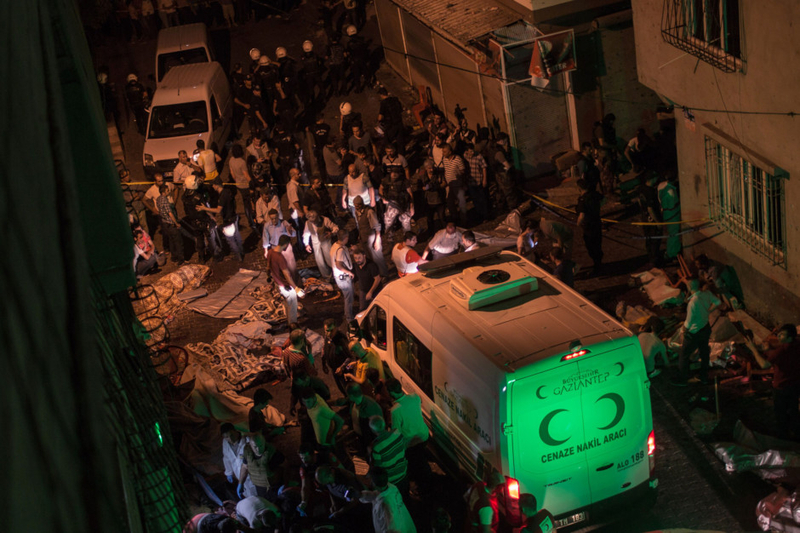 Mehmet Erdogan, a ruling Justice and Development Party (AKP) lawmaker for Gaziantep said there was a "high possibility" it was a suicide attack, comments echoed by Deputy Prime Minister Mehmet Simsek. Dogan news agency said the suicide bomber had mixed in with the guests before detonating the charge. Security forces are now searching for two individuals who entered the celebration with the suspected bomber and then fled, it added. Gulser Ates, who was wounded in the attack, told Hurriyet the attack took place as the party was breaking up. "We were sitting on chairs, having a chat with one of our neighbours. "During the explosion, the neighbour died on top of me. I remember being underneath. If my neighbour hadn't fallen on top of me, I would have died," she said. "The bride and groom's happiest day was poisoned." A major city lying just 60km north of the Syrian border, Gaziantep has become a hub for Syrians fleeing the civil war in their country. But as well as refugees and opposition activists, there have long been fears it was home to a significant militant presence. 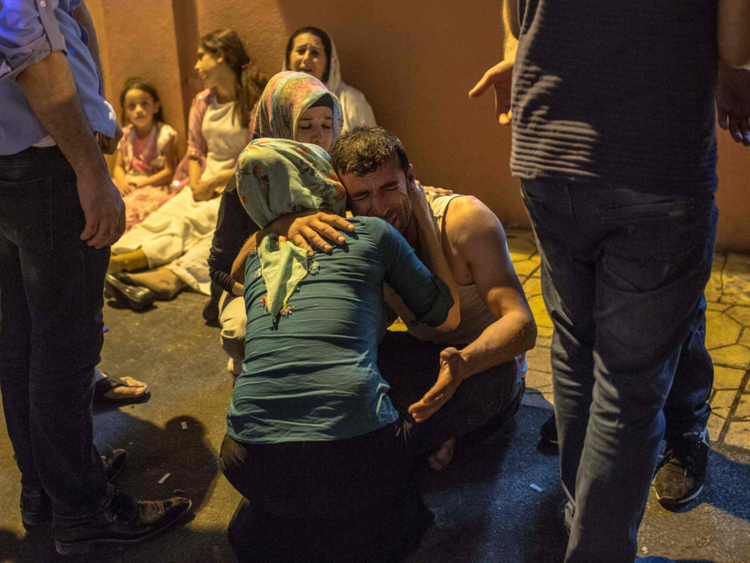 Images from the scene showed bodies covered in white sheets while distraught relatives of the victims were comforted in the street. Police also fired in the air to prevent further tensions after scuffles broke out when a group brandishing Turkish flags arrived on the scene, images showed. Daesh suicide bombers have carried out attacks in Istanbul several times this year, while Kurdish militants have hit targets in both Ankara and Istanbul. On Thursday, 12 people were killed in a spate of bombings blamed on the PKK, who Erdogan said had killed 70 members of the security forces in the last month alone. 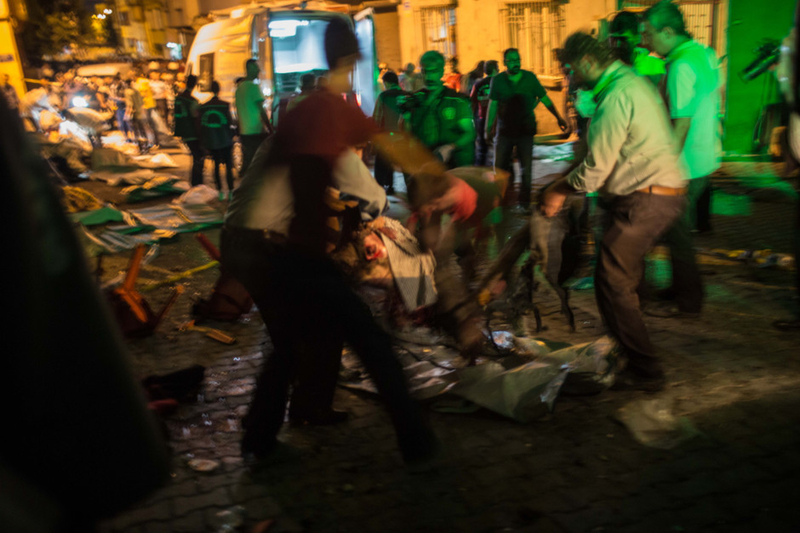 The blast in Gaziantep came just hours after Yildirim said Ankara would in the next six months play a "more active" role in efforts to solve the Syrian civil war. Turkey was long accused of turning a blind eye to or even abetting the rise of Daesh in Syria, claims it vehemently denies, but has taken a tougher line after the militant attacks on its soil.